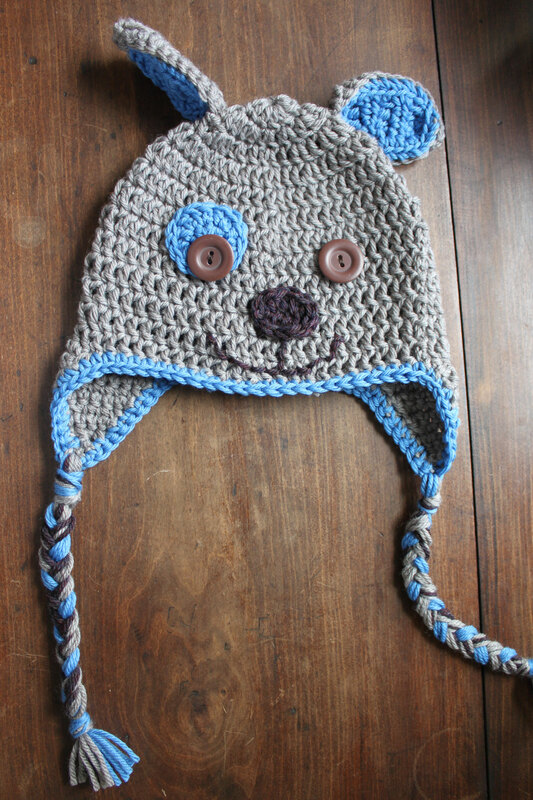 This is a hat I crocheted for my cousin’s little boy. He’s having a puppy-themed first birthday party! He’s going to rock this hat if he keeps it on, because he’s even cuter than it. I’m making one for Worth too because he saw the work in progress and decided he needed some of that in his life too. I used this pattern by Sarah Zimmerman and the washable merino wool from Knitpicks. This is a project I’ll definitely want to blog about again, once I can get a picture of it on the newborn kitty herself. Dorothy decided months ago that she wanted to be a witch for Halloween and that she wanted her new baby sister to be her black cat, which seems like a totally fitting Halloween costume for a baby who is just going to be dressed up and paraded around to suit her mother and big sister for at least the first six months of her life. Dorothy was set on a really expensive witch costume from Chasing Fireflies, but fortunately we encountered a much cheaper but equally awesome version at a TJ Maxx. I looked all over the internet for a newborn kitty costume, since as I said before I’m not that into sewing costumes that are only going to get worn once or twice. (I did break my own rule last Halloween and sewed Dorothy’s Little Red Riding Hood costume and Worth’s wolf suit. Dorothy’s dress was just as disappointing to me as I’d thought–she wore it on Halloween and never again, even though I thought I’d made it in such a way that she might consider wearing it as a regular old dress without the cape, but no. Worth, however, has worn the wolf costume enough that I don’t regret the time. He even wore it to music class at least once last spring! And he looks so awesomely Where the Wild Things Are when he wears it around the house.) Anyway, I could not find a ready-made newborn kitty costume. I found many infant costumes, but my baby due October 12 would surely be overwhelmed by a costume intended to fit a child up to 3 months. Plus comfort is a big issue for a newborn, and many store-bought costumes are itchy. So I ordered a newborn-size black onesie and thick black tights (not pictured). I crocheted a kitty hat, mittens, and booties and fabric glued felt on them for the paw pads and inner ears, then I stitched a kitty tail and little pink belly onto the onesie. There’s no reason I can’t put the booties, mitts and hat on her sometime again, except that I’ve made so many at this point they may never make it into rotation! I admit to feeling pretty miserable here in these last weeks. I’m totally feeling the “advanced maternal age” stamped across the top of my chart at my obstetrician’s office. As the weather finally turns cooler and fall decorations and winter squashes start cropping up everywhere I’m feeling very ready to reap this little harvest of my own. I’m trying to remind myself that another two weeks aren’t a big deal in the big picture, but I have to say that 16 (or so) more mornings of dragging my huge, sore, cumbersome self in and out of bed and around to all the places life requires seems a little daunting at this point. I think all the baby projects are done, she just needs to show up and try them on!